The Joel McHale Show with Joel McHale is a new, weekly half-hour topical series that takes a sharp, absurdist look at pop culture and news from across the globe. It’s a fast and funny distillation of everything people are talking about that week. 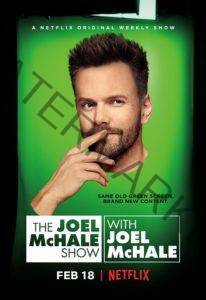 Featuring celebrity guests, comedy sketches, and insane video clips from the worldwide realms of TV, sports, politics, celebrity culture, and every corner of the internet, The Joel McHale Show with Joel McHale is destination viewing for comedy lovers, or people who just really, really like green screens. An Unscripted Show Hosted By Joel Mchale, Taking An Absurdist Look At Today’s Pop Culture From News Sources Around The World.